Crafty time today! 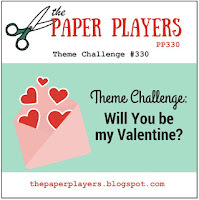 I made a Valentine today, inspired by a couple of challenges, including the sketch at CAS(E) this Sketch #208 and more especially by Jen Mitchell's card. I am also entering this card at AAA Cards #83, Addicted to Stamps and More #228: Holiday, The Paper Players #339, Just Add Ink #346: Just Add 2--and I added hearts and flowers, Simon Says Monday Young at Heart, and Retro Rubber #55: Heart (my sentiment stamp is from last year). 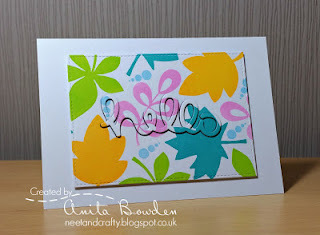 My second card for today was inspired by this bright and fun card from Anita over at Muse #202. 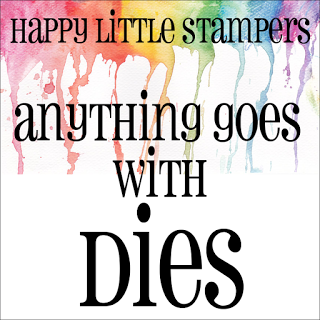 I was inspired by Anita's all over stamping, bright colors, and inlaid built up die cut sentiment. I stamped a random pattern of dog silhouettes in primary colors, and then die cut 'HUGS' from that panel. I die cut hugs twice more out of red, and then glued them together and placed them back in. Here is a close up of the die cut area. 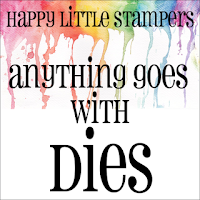 I am also entering this card at Simon Says Wednesday: Cute, Addicted to CAS #104: Pets, and Happy Little Stampers Anything Goes with Dies February. That's a pretty heart die and I like the way your sentiment curves with it! Those colorful pups are too much fun, cute card!! Beautiful heart card, Joyce! And I love your fun pet design. All those wonderful pups are so bright and happy! Super striking card and that heart die cut is quite the beauty. Thanks for playing at AAA Cards. I like how the restraint of the rest of your card gives that stunning heart die a chance to breathe and shine. I think you've made a great choice for the background paper as it has enough pattern to give interest without taking away from that showstopping heart. Thanks so much for joining us at Retro Rubber. That heart is gorgeous and pops off that background Joyce! Your second car card with all the doggies is so sweet and what a great idea to substitute flowers for cuties I primary colours! Thank you so much for sharing at Muse this week! Beautiful card...love the CAS look! 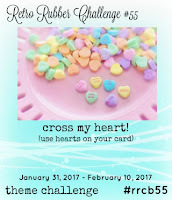 Thanks for playing along with Retro Rubber challenge. 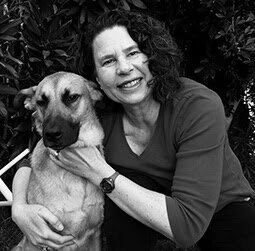 I love those dog silhouettes stamped in different colors, Joyce. 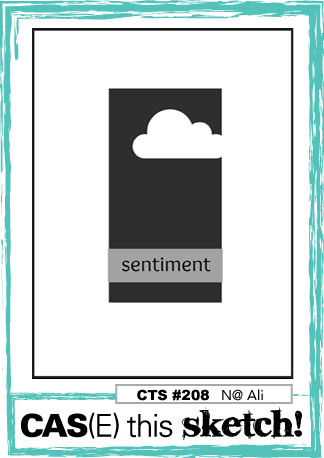 Adding the hidden sentiment gets the message across without interfering with the images. 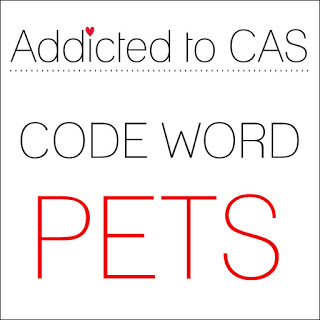 I'm so glad you shared your card with us at Addicted to CAS. Love that heart card, Joyce. Really simple but oh so effective. And your interpretation of my card is fabulous, loving those pups in primary colours, really striking. Love the primary colours and the dogs! So glad you joined us at Muse this week, Joyce! Your heart is just perfect over that fabulous embossed base, Joyce! 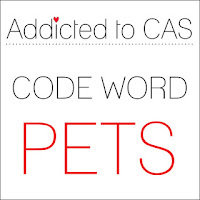 I was particularly fond of Jen's card, too ... and the pups? pup-adorbs! 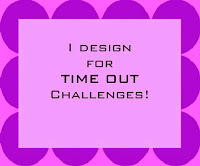 Apologies galore for being MIA of late; just returned from 12 days at my mom's on a 'working' holiday, marking Gr. 12 diploma exams. Bonus: time with mom and my niece and nephew; made the long hours of grading more bearable! Doing some catching up on your gallery with 'words' (thought bubbles were sent previously *grin*...often at 5:30 am when I was up, getting ready to catch the bus...not something I do in small town Canmore!). Your intricate heart is ever so pretty, and the pups? Sweet! A clever take on Anita's card! Just popped over for a closer look at your take on the Muse card. Great CAS card that I might have to CASE. 😀 Thanks for playing along with RRBC. Adorable Valentine card....love that gorgeous heart! But your sweet hugs/dog card steals the show for me, just as sweet as can be. What a fun take on the Muse challenge. So cute. 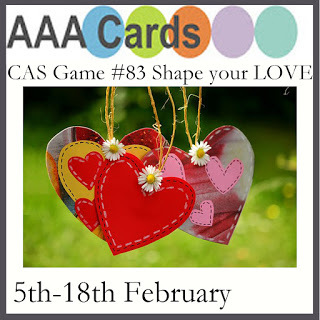 Wow, your heart card is stunning! I agree with another commenter on your great restraint not to add too much. Its simply perfect. 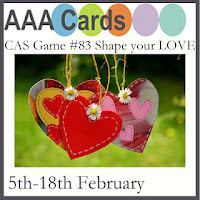 Your heart card is beautifully CAS and very striking, Joyce!!!! I love the dry embossing!!!!! Your card with the doggies are so fun and cute - love the little green paw-prints to fill the spaces!!!! The bright colours are lovely!!!! Fabulous! I love the background with the pop of red with the heart. Thanks for playing along with us at AAA Cards! The heart card looks amazing,love the blue panel! The dog background is so darn cute and colorful! Hope all is well you and the family, Joyce! There's that yummy heart die again and I love the way it's off the edge of the grey. And your second card? Be still my heart. I love it!! What a colourful doggy inspired card Joyce, sure to cheer anyone down in the dumps. I must try this hidden words technique!